**Please note, this item is NOT a complete new assembly. Installing headlight halos on your vehicle will require applying this item to your EXISTING headlight assembly. SMD Halo Kits by Oracle Lighting are taking the automotive aftermarket by storm. Installing a SMD Halo Light Kit on your vehicle will instantly change the entire appearance of your vehicle, especially at night. Oracle Halo Kits are of top quality. USA Made, No Inverter is required. Connect directly to 12V Source, such as your parking lights, for automatic operation or wire them to a switch for manual control. Oracle SMD LED Halo Kits use a rigid PCB with hundreds of leds on it, meaning the halo rings will not break and the light shines directionally forward. The rings have an industrial grade self adhesive backing, so they easily install onto the headlight. Approx. 100,000 hour lifetime. The unique design of this headlight halo ring makes it water proof and it simply adheres to the lens of your existing headlight. You won't need to open the headlight assembly up to install this halo kit. 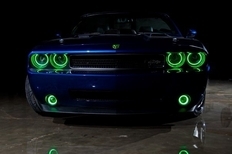 This LED Halo Light Kit fits 2009-2014 Dodge Challenger models and comes with the halo rings for both Headlights . Fog Light halos are NOT included and are sold separately.